Finally got the opportunity to get my hands on a group of Limnopilos Naiyanetri... aka Thai Micro Crabs! These are some of the more unique crabs available that are fully aquatic. 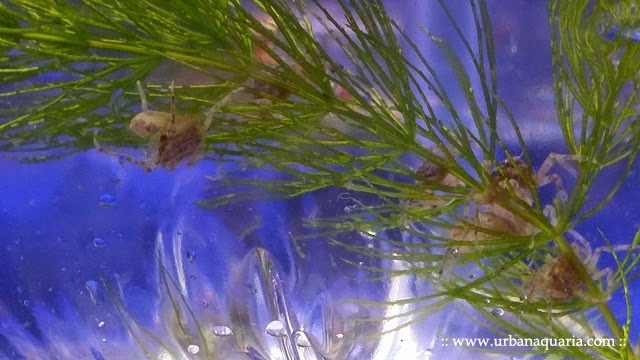 Add to the fact that they stay very tiny in size (only around 1 cm in length, excluding their legs), these micro crabs make for very interesting inhabitants in smaller tank setups. Just for scale comparison... here is one resting on my palm. They seem to be quite capable of traversing across dry "land", i guess in nature they can crawl around to different water sources in search of food and shelter. 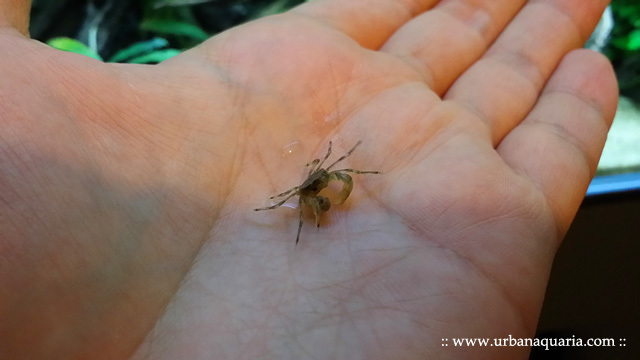 While i was in the midst of transferring them to my main tank, one hopped off the net and started to scuttle around my hand. When newly introduced into a tank (after a suitable period of drip acclimation), they tend to exhibit a pale transparent coloration. Once they adapt to the tank environment, their original brownish colors gradually return, though i noticed that they will still switch between colors depending on mood and also to match their surroundings. So far, i've only caught brief glimpses of them in my tank. 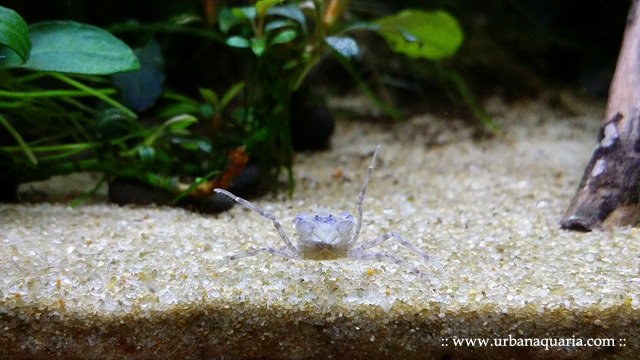 Once they disappeared into the plant growth, i've not been able to get a good photo of them yet... thats one of the considerations when keeping micro crabs, they are tough to observe in planted tanks! 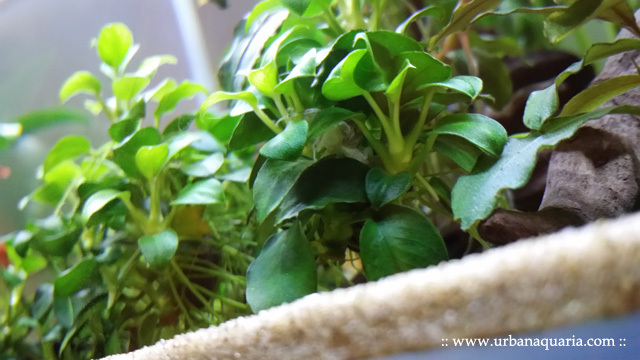 Can you spot the micro crab hiding inside this clump of Anubias sp. "Petite"? They spend most of their time moving between dense plant growth while scavenging for food, i've seen them actively picking along the surfaces of plant roots and leaves, they also graze on algae wafers and blanched zuchinni too. It seems they are quite similar to cherry shrimps in terms of diet and care. Do I need to keep my tank covered if I keep them, or are they not fond of escaping? So far i've not seen any of them attempt to escape, they prefer to say hidden amongst the submersed plants and their roots. I guess if you have hardscape or plants that protrude out of the tank or if your tank water levels are filled right to the brim, then there "might" be a slight chance a micro crab may inadvertently crawl too high and accidentally fall off out of the tank... otherwise, it shouldn't be an issue for most tanks and a cover isn't really required. I have several Ottocinclus and Red Lizard pleco in my tank. I was wondering if you know whether this micro crab would might actually try to bite/attack those peaceful fishes. Thank you very much. Its unlikely that the micro crabs will bother those fishes as its very small and its claws are even tinier. I keep them with small fishes and shrimps without issues.